Great photographers bring us good news and bad news. They’ve captured that decisive moment – and it is beautiful or trenchant, often both. Well, yes, but the young girl* caught by Henri Cartier-Bresson’s lens has since run right out of the frame, never to return. The moment in reality is gone; what we’re left with is the artist’s vision. Nice consolation prize after all; one for which we’re indebted to an eclectic French publisher – really an impresario of the image: Robert Delpire. If New Yorkers hadn’t known Delpire’s name, or been aware of his contribution – “Delpire & Co.,” a four-venue show, made a point in Spring 2012 of Delpire’s influence. In fact, as this exhibition coordinated by the Aperture Foundation made clear, Delpire has called the world’s attention over the past six decades not only to genius in photography but also in illustration, graphics and children’s stories. Delpire’s Illustrateur series hung at the NYU Maison Française (off UniversityPlace in the Washington Mews, Greenwich Village), and examples of the photographers’ workthat he’s published, and helped to define, were shown to advantage by The Gallery at Hermès (691 Madison Avenue). All facets of Delpire’s visual fascination, especially photography, were on view in the Aperture Gallery loft near the Highline (547 West 27th Street, on the fourth floor). Hermès (a major corporate sponsor of photography) displayed the photographs in a handsome yet intimate ovoid space, and the viewer also could stand and leaf through the glorious photography volumes from Delpire’s press. 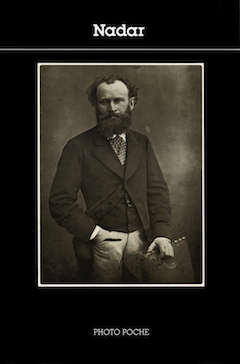 The work of Félix Nadar, photographer to Paris notables starting in the 1850s, debuted Delpire’s Photo Poche series. Among the ways in which Delpire exposed photographers’ work to a broad audience was by publishing a series called Photo Poche. In this high quality yet modestly sized and priced format, the titles number well over a hundred, and counting. The array of great photography in small books made a stunning Photo Poche wall of its own at Aperture. Revisit Photo Poche: link to the photographer’s name to see the book cover, link again for a helpful (if sometimes hit-or-miss) English caption. An exhibition of Depire children’s books was at the Cultural Services of the French Embassy, but you could hear him talk about them, and about all his work, in a video interview that played in a loop at Aperture. (Fifty lively minutes, in French with good subtitles). *The series of 2012 Manhattan exhibitions honoring Delpire’s editorial work inspired the (above) blogpost in which I alluded to Henri Cartier-Bresson’s photo of a “leggy boy.” But as I wrote that, I wondered whether I really remembered the photo . . . or did I imagine it? The photo whose reality I doubted back then hung for several months in a Cartier-Bresson exhibition at the Centre Pompidou in Paris. (spring 20– When I came upon the print in that definitive and gratifyingly monumental show, I discovered that the figure in the photo is, as it turns out, a young girl. I realized, too, at the “Beaubourg” (as the Pompidou also is known) that the image, shot in Sifnos, Greece, and dated 1961, likely is my personal quintessential photo. Among the photojournalists (so many of them French) whose work helps inform the way I see the world, Cartier-Bresson was among the first and most influential. Communing in the Pompidou galleries that spring with C-B’s prodigious work, I had congenial company: some of about a dozen Bennington College alumnae who’d come to Paris to join Bennington French prof’ Stephen Shapiro for the real life finale of Stephen’s “Americans in Paris” online course for College alumni. After my three hours with Cartier-Bresson – my college confreres eventually had to leave me behind – I was satisfied that I’d begun, at least, to renew my relationship with his work. 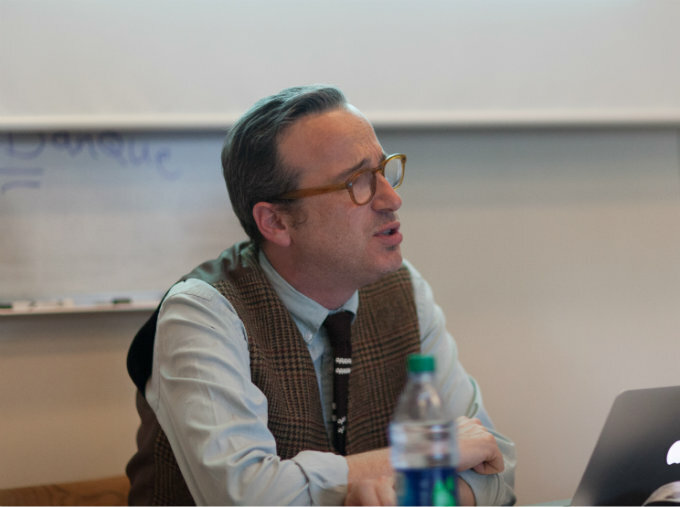 Stephen A. Shapiro, PhD, taught an online course, “Americans in Paris,” for Bennington College alumni. Photo: Briee Della Rocca. I drifted down through the fabulous Pariscape afforded by the Pompidou’s exterior escalators. In the museum lobby, the Flammarion bookstore offered an array of publications about Cartier-Bresson. Finally, I chose a small book of sixty-three black-and-white photos – the Photo Poche Cartier-Bresson. A factor in my purchase: image number 47. . . Sifnos, 1961. Reading the selected bibliography that completes the Photo Poche, I learned that Robert Delpire first published a Cartier-Bresson title in 1954. He went on to publish three more, and then, after inaugurating the Photo Poche series in 1982 with Nadar, followed up later the same year with Henri Cartier-Bresson. By 2009, five years after the photographer’s death, the Photo Poche Cartier-Bresson had gone through fourteen printings in various languages. Visitors at the Centre Pompidou waited at least a half hour to see the exhilarating C-B show. I’m only one of many, I’m sure, who lingered for several hours to absorb the vision of this enduring modern master. This entry was posted in Arts + Commerce and tagged Aperture Foundation, Greece, Henri Cartier-Bresson, Hermès, Photography, Washington Mews by Ellen Count. Bookmark the permalink.